The 30th Banned Books Week begins on Sunday, Sept. 30, shining a bright light on the liberties represented in the U.S. First Amendment. For the past three decades, the American Library Association, along with booksellers, publishers, journalists, teachers and readers of all stripes, have used the last week of September to highlight the value of free and open access to information. There’s a helpful page on the ALA website explaining the difference between banned and challenged books and why certain books are challenged. Many of the books frequently challenged are ones you’d expect to encounter in high school: The Great Gatsby, To Kill A Mockingbird, Nineteen Eighty-Four and The Call of the Wild (see a longer list of challenged classics). This attempt at censorship in schools, I think, is a distinct danger because if you encounter ideas that challenge or confuse you, it seems to me there’s no better place to do so than in a classroom, where you have the ability to discuss these concepts, ask questions, listen to other points of view, and share or reassess your own. Have you ever read a banned or challenged book? 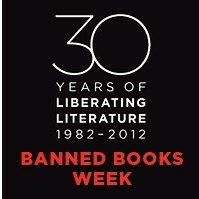 How will you commemorate Banned Books Week?